In this study, first published in 1979, Landow contends that Hunt’s version of Pre-Raphaelitism concerned itself primarily with an elaborate system of painterly symbolism rather than with a photographic realism as has been usually supposed. Like Ruskin, Hunt believed that a symbolism based on scriptural typology – the method of finding anticipations of Christ in Hebrew history – could produce an ideal art that would solve the problems of Victorian painting. According to Hunt, this elaborate symbolism could simultaneously avoid the dangers of materialism inherent in a realistic style, the dead conventionalism of academic art, and the sentimentality of much contemporary painting. 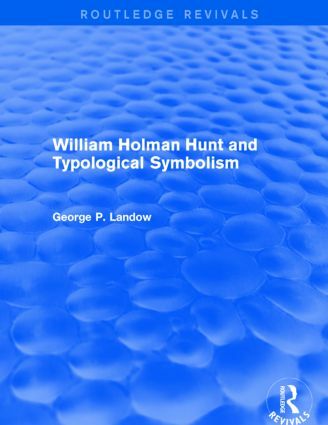 George Landow examines Hunt’s work in the context of this argument and, drawing on much unknown or previously inaccessible material, shows how he used texts, frames, and symbols to create a complex art of mediation that became increasingly visionary as the artist grew older. This book is ideal for students of art history.